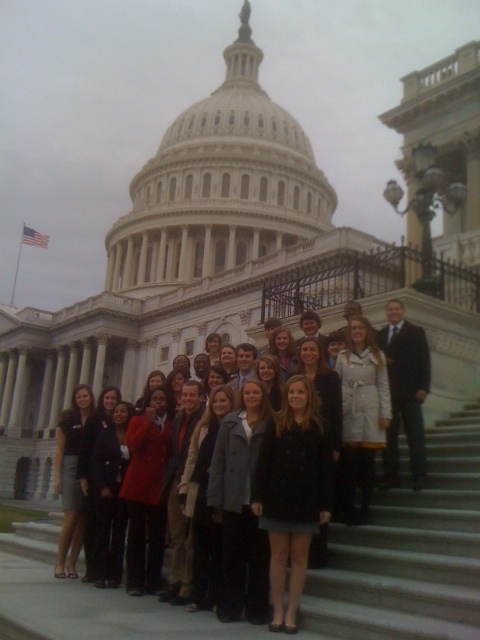 Next was a chilly walk to the steps of the Capitol for as group photo. Next to us was Iowa Senator Check Grassley visiting with a group from his state. From there it was on to 101 Constitution Avenue for a media panel discussion led by Rex Buffington of the Stennis Center for Public Service, and featuring Senator Thad Cochran’s Press Secretary Chris Gallegos and Matt Letourneau, Director of Communications and Media at the U.S. Chamber of Commerce. Each discussed their backgrounds and the challenges facing those who are the public relations personnel of their organizations, especially in the burgeoning age of social media. The next presenter was Jessica Knight, Executive Director of the Congressional Black Caucus PAC. She is a native of Hattiesburg, and attended Millsaps College where she was the first African-American Homecoming Queen. She provided insight related to fundraising for a political caucus, as well as sharing her background and how she got interested and involved in politics. By now it was mid-afternoon and time for a ride on the Metro to Foggy Bottom and a visit to The Watergate, where Mississippi State alums Tim and Grace Terpstra hosted the group in their apartment to snacks and a history lesson about the Watergate complex. Dr. Martin Wiseman of MSU, Dr. Tim Terpstra of George Washington University and Dr. Stephen Gordon of Old Dominion University discussed the political implications of the Watergate break-in, and how the surrounding events have influenced the country’s history. One of the threads running through the day was that each of the presenters told about their journeys from college student to where they are today. The Stennis Montgomery Association members thus gained valuable insight and motivation for their own futures. Looking back on the day, one wonders what it must have taken to put all of this together. Credit for that task goes to SMA President Grace Craig, who coordinated the entire schedule of presenters and other aspects of the trip. Grace Craig is a senior English major from Jackson, Mississippi. Actively involved as a student, she has served as Mississippi State University Student Association Director of City of Starkville Relations. 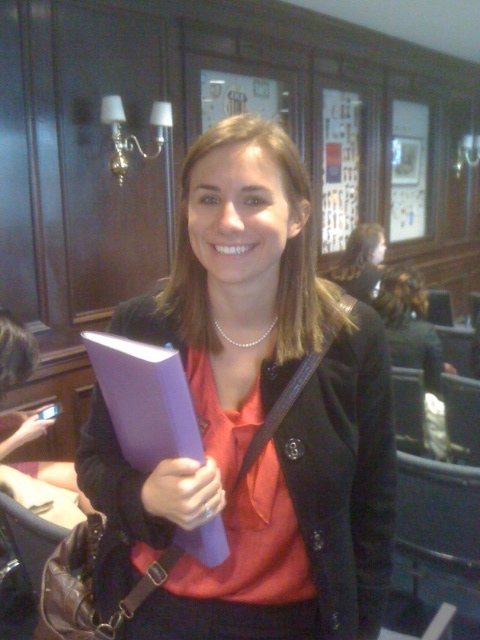 She interned in Washington, D.C. last summer. She is interested in a career in economic development, preferably in Mississippi. This week I am in Washington, D.C. as a chaperon to the annual Stennis-Montgomery Association trip to Capitol Hill. The Stennis-Montgomery Association (SMA) allows students of all backgrounds and academic disciplines to become active on the political scene. Each year the most dedicated members of the organization visit Washington D.C. , to meet and network with MSU alumni and other prominent political figures. There are 23 students and five chaperons. For the next few days I’ll making daily posts about our briefings and visits to various places. We will start today by gathering in the lobby of the hotel and taking the Metro to Capitol Hill. It is a three block walk to the nearest Metro line that will take us directly to Union Station without changing trains. Our schedule today includes a briefing by the Director of the National Republican Congressional Committee, a media panel luncheon and an afternoon session at The Watergate. It looks like a cold and wet day. The high temp is forecast to be 43 degrees at 8:00 a.m., and then dropping to 41 degrees as a cold rain moves in about noon. They say that the cherry blossoms will be fine though. I will be tweeting often during the day. To follow my tweets go to www.sig.msstate.edu and click on the “t” logo at the top right hand side of the page, or go to www.twitter.com and enter jcstennisinst in the search box. Later today I’ll post a recap on this blog. Thanks for your interest in the Stennis Institute and the Stennis Montgomery Association. Good advice for anyone considering local political office. So, if you are into conflict avoidance you probably would not enjoy being mayor of a small town. On the other hand, if you enjoy solving problems and bringing people together then local political office may be right for you. By the way the most important part of conflict resolution is the ability to listen, with the intention of understanding why the person feels the way that they do. Rent the House of Representatives? The one in Washington? The state Capitol? Well, not exactly. However, your organization can rent the House of Representatives Chamber at the Old Capitol Museum in Jackson, Mississippi. Also available for rent are the Chancery Court and the William Nichols Room at the facility. As one who has attended a number of events there I can tell you with confidence that there is an aura there like no other meeting facility. The House of Representatives Chamber is exquisite. One can only imagine what it was like there when the Married Women’s Property Act was debated in 1839, or when representatives decided to secede from the Union in 1861, or when the 1868 and 1890 state constitutions were argued and drafted. A tip of the hat to the Mississippi Department of Archives and History for allowing organizations to use the most historic building in Mississippi for meetings. Click on the Old Capitol Museum main Web site, and then Facility Use for complete information. It’s baseball season, and chances are you will see a story or two about what baseball players do to bring them good luck. Some players players won’t step on the foul line when taking the field, for example. Baseball is full of superstitions. So, have a great day – and good luck! It would be difficult to add much more to the accolades and tributes about Gray Swoope, Executive Director of the Mississippi Development Authority(MDA), who is leaving soon to take a similar post in Florida. Nevertheless, I’ll do my best to contribute by mentioning something attributable to Gray that often goes unnoticed. Thanks, and best wishes, Gray. Regional collaborative artist (TR) recently premiered their latest music video Coma Boy at the February 2011 Oxford Film Festival, simultaneously releasing it to an eager online audience. This is the fifth music video in three years to be released by (TR), of which the primary creators are duo Daniel Guaqueta and Clay Hardwick. While Guaqueta, an experienced pop-rock electronica, avant-garde musician from Colombia is responsible for overseeing the music behind (TR), Hardwick takes a drivers’ seat in steering the visual manifestation of the group; even using live projection to craft a more immerse experience at live (TR) actions. The latest video released, Coma Boy is an electro-pop croon with solid Latin rhythms underlying this playfully digitized deconstruction. Playing off images of workers from a range of classes: pizza cook, office square, medical tech, yard man – the South American cadence unites them all in an allusion to the steady trance of a strong rhythm creating a release into the cycles of life…even the redundancy of everyday work. The labor-induced coma is the natural escape of all workers who have color sucked from their job. (TR) brings these disconnected everyday workers together in an alternate reality: a Pool Party! The culmination of this piece is a splash-crazed pool bonanza allowing all the characters to let loose and embrace imagination. The video reveals painted dancers as a mass of guests frolicking and laughing in this daydream they share. Production for the video included a wide community of friends in various roles and was, to their credit, accomplished in only five weeks. With tight coordination and the environment which comes from working with friends, we completed our shooting in one week and knocked out an astonishing post production schedule in a month. The workers featured were shot in near cinéma vérité style in their normal working conditions thanks to some local art-supporting businesses and organizations. Humdrum turns fantasy in this colorful, upbeat music video. All production took place in Jackson, Mississippi USA. The video was released online and select screenings on February 13, 2011.